This is my first post about eating in Williamsburg, although it’s not my first time eating at a restaurant in Williamsburg. There is so much happening in Williamsburg (Brooklyn) in the restaurant world, that one just has to visit it if one is interested in food and eating out. On a recent week night, we went to Gwynnett St. and enjoyed the delicious Modern American food cooked by one of the two chefs there – Chef Justin Hilbert (left in a few days after we ate there) and Chef Owen Clark. Despite having read about Gwynnett St. (the restaurant), I thought that Gwynnett St. is the name of a Street in Brooklyn. It was only when I saw the Open Table entry that I realized that it’s the name of the restaurant. The restaurant’s name is an “ode to old Williamsburg and a metaphor for the unique and expanding food culture that connects Brooklyn’s restaurateurs, chefs, and artisans to NYC and beyond” – says the restaurant’s website. The menu at Gwynnett St is short with about 5 appetizers and about 6 entrees – it changes based on availability of ingredients. While the key ingredients are listed, it is not highly descriptive of the dish that will appear in front of you. That does not mean, however, that the dish does not match what is listed, it’s just that the plating is so exquisite and “there is so much going on in the dish” (the words of the wait staff), that it is too difficult to describe any dish at Gwynnett St. Eating at Gwynnett St is a highly sensory experience. Flavors and textures come together in wonderful combinations that make a dish highly memorable. 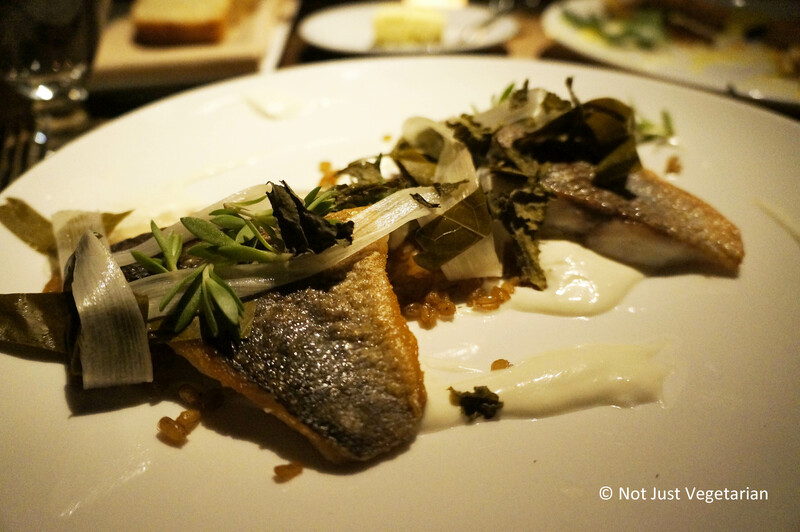 I am hoping my pictures do justice to the creative Modern American dishes served at Gwynnett St.
We ordered the whiskey bread (house specialty), the watercress salad, the puntarella appetizer, the cashew entree, the Dorade (fish) entree, and a walnut dessert. 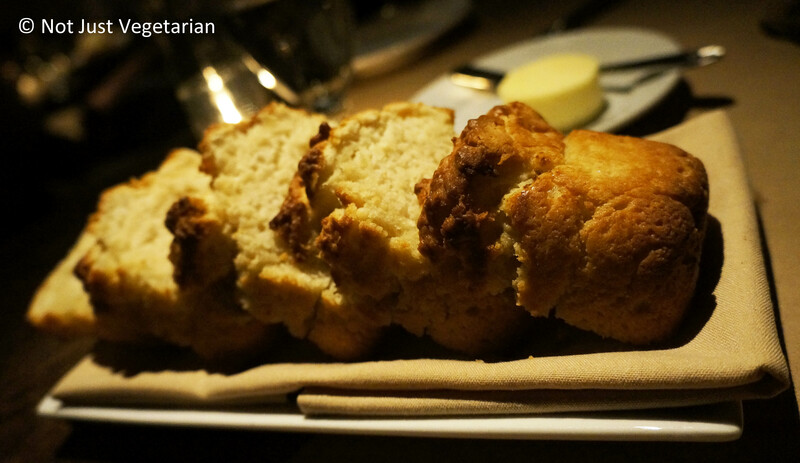 The whiskey bread came with cultured butter. 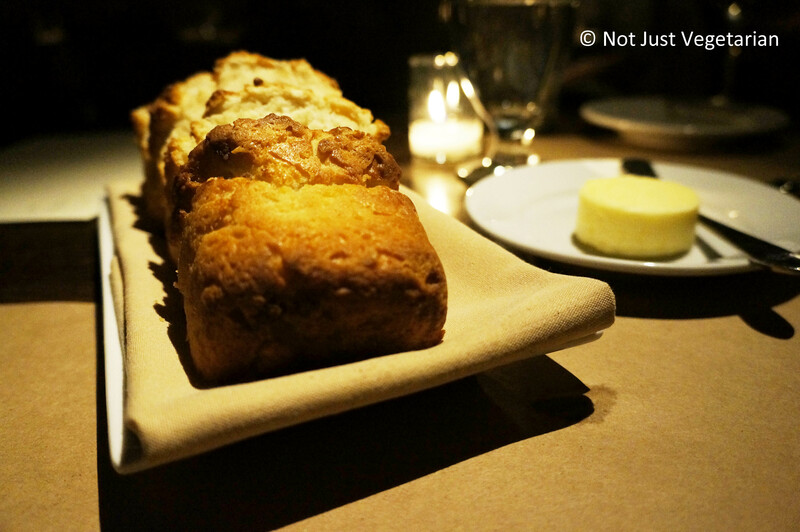 The bread had a beautiful crust, a crumbly texture, and a mildly sweet and savory taste. It’s very easy to become full when you have warm bread served with fresh butter in front of you. I had to exercise a lot of will power to stay away from more than one slice of the whiskey bread and the cultured butter. If you are like me and want to know about what cultured butter is, see this post by Michael Ruhlman. The watercress salad arrived in a large bowl. I loved the thinly sliced pickled egg yolk, and the slightly spicy yellow mustard seeds. I particularly loved the crisp Hokkaido bread (a Japanese style bread made with vegetable ash and hence it’s dark color) as well as the cheddar cheese, and what looked and felt like a creamy avocado dressing. I highly recommend getting this watercress salad. The puntarella appetizer was delicious. Puntarelle is a type of chicory (read more here). This is another highly recommended dish. The olives, the pistachios, and the blood orange offered excellent taste and texture contrast to the cooked and grilled puntarella. The plating is beautiful as you can see (my photo does not do enough for the Puntarella appetizer). The cashew entree felt and tasted like pureed toasted cashew. The turmeric used in the dish was not the turmeric powder typically used in Indian cooking,but was the root / rhizome ground into a paste (read more about Turmeric and its rhizome here). The black garlic crumbs mixed with the roasted, unsalted cashews casually sprinkled were simply amazing. 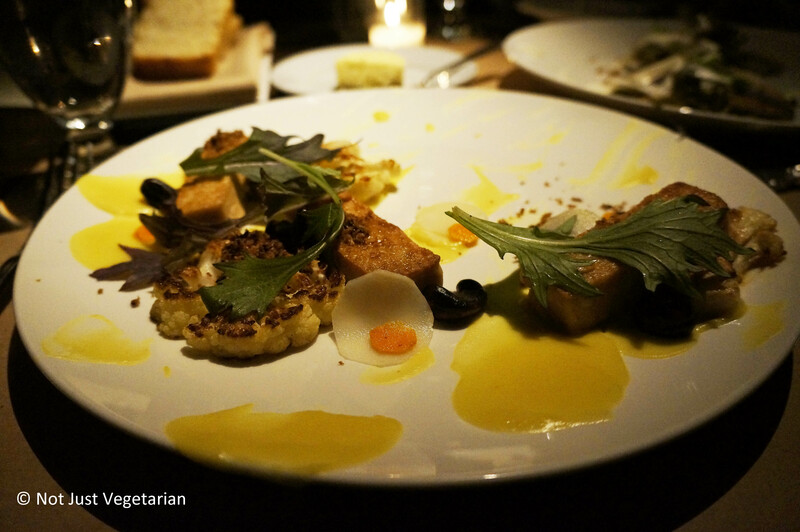 I loved the small pieces of charred cauliflower florets that were also tossed in this dish. The dorade entree came with wheat berries, grape leaves, and mastic yogurt. This dish smelled intensely of the sea / fish for us. Compared to every other dish served, this dish is worth skipping. 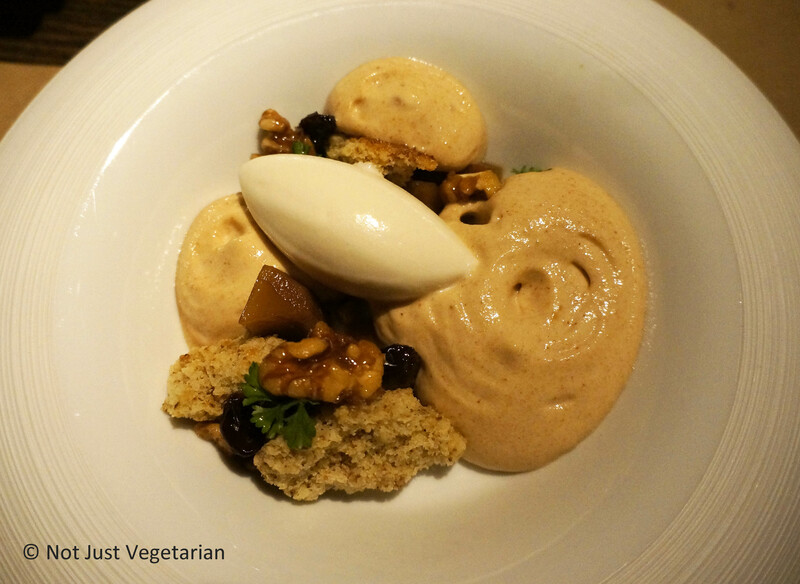 The walnut dessert had raisin foam, some raisins, parsley ice cream and a walnut cake. The ice cream was had a refreshing parsley flavor, and was not too sweet in contrast to the sweet raisin foam. The walnut cake had been dehydrated to become crumbly. Another must order item from the menu at Gwynnett St. 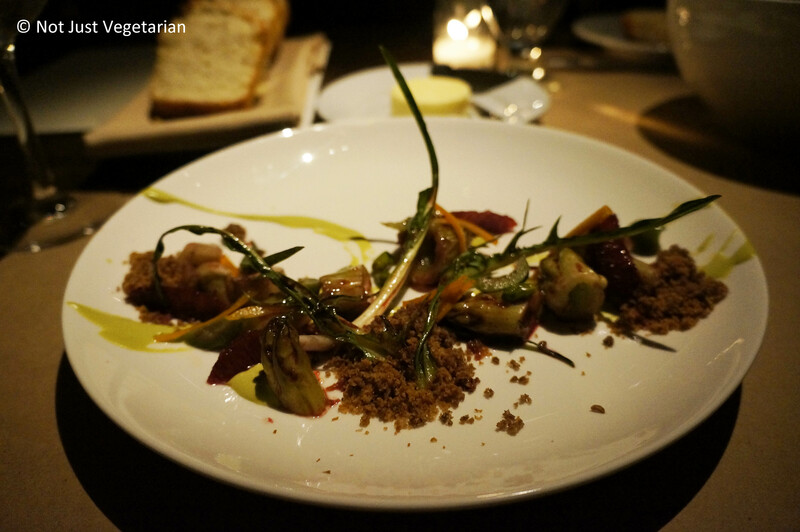 Overall, I would go back to Gwynett St. to try their seasonal menu of other seasons. We ordered all the vegetarian items and the one sea food entree listed on the menu. But make sure you order a dessert. 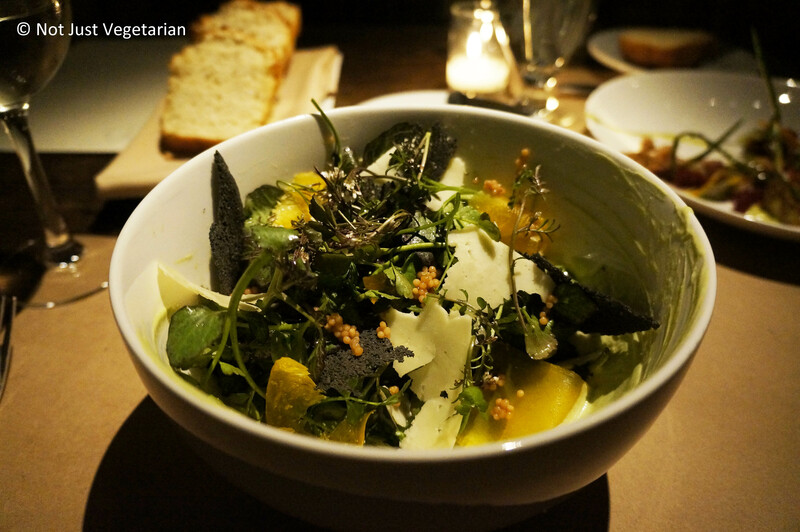 Recommended: Watercress salad, puntarella appetizer, cashew entree, and the walnut dessert. Tags: blooger reviews of Gwynnett St., cashew entree, Chef Owen Clark, critic reviews of Gwynnett St., Cultured butter, dorade entree, Gwynnett St. williamsburg, how is the food at Gwynnett St., puntarelle, recommended dishes at Gwynnett St., vegetarian at Gwynnett St., watercress salad, what to eat at Gwynnett St., what to order at Gwynnett St.
We love Brooklyn too. the ambience at restaurants in brooklyn is a good mix of being modern, and warm. The watercress salad looks yummy.